Today's post is about sandwiches. 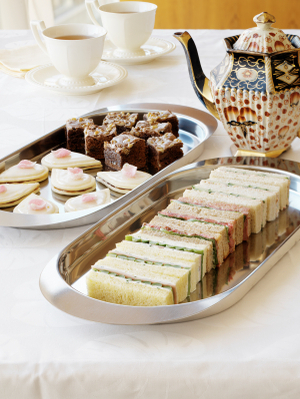 I'm not talking about baguettes, club sandwiches, baps, or anything Franco-American; instead, I mean the good old fashioned, traditional, quintessentially English, finger sandwich- delicate tea-time treats, made from soft white bread. This is a disappearing art, which, these days frankly, you're more likely to encounter in a smart hotel somewhere than in a private drawing room. Legend has it that they were invented by John Montagu, the 4th Earl Sandwich (a member of the Hell Fire Club), who is supposed to have called out to his servant: "My Man, bring me some ham between two slices of bread! ", so that he could carry on gambling at the tables uninterrupted. Actually, sandwiches were probably in existence before then, but it's true, at least, that he gave his name to the thing. Here are some of my ideas for a classic set of sandwiches. It's essential that you use a pre-sliced white sandwich loaf, and that you cut them across lengthways- so that they form "fingers". The sandwiches can then be assembled on the serving plate to form a "block" (if that makes sense) and then decorated with watercress on top. I'm not that keen on sandwiches cut into triangles. First, tomato and watercress. Take two slices of white bread, and cut off the crusts. Spread them with soft unsalted butter and then create the filling from sliced tomatoes (patted dry to remove any moisture) and chopped watercress. Season with salt and pepper and then cut the sandwich carefully into fingers. Secondly, cucumber. Unsurprisingly, it's the same procedure as the above, except the filling's made from thinly sliced cucumbers (which have been patted dry, and had the skin removed). Season with sea salt and pepper. I love the combination of the delicate cucumber, with the salt, and the butter. Surprisingly refreshing- especially with a cup of near-scalding Earl Grey on a hot summer's afternoon. Finally, Queen Alexandra's Sandwiches; classic Edwardian sandwiches with a savoury taste. First, make a mustard butter. This is just unsalted butter (left at room temperature), mixed with a mild French Mustard (say, Dijon), and lemon juice. Spread the sandwich loaf slices with the mustard butter. Next, lay thin slices of tongue onto the buttered bread. The filling's made from chicken and mayonnaise. Poach some chicken breasts until cooked, and then mince them up. Bind them in home-made mayonnaise, and flavour it with a few drops of Tabasco sauce. Sprinkle with a new layer of mustard and cress and season with sea salt and black pepper. As before, top off with another layer of white bread, remove the crusts carefully, and cut into fingers.